Delicious all year round, this versatile legume is a great base for a quick and hearty dip. 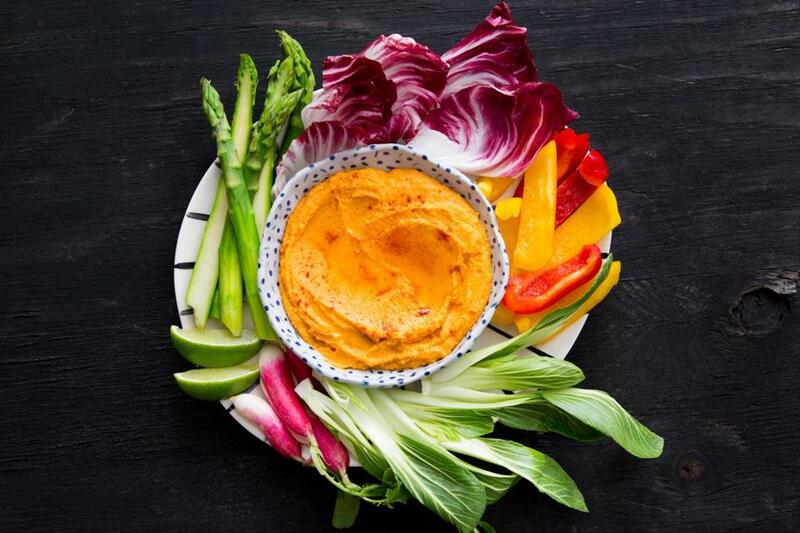 Red lentil and sweet potato dip with smoked paprika and lime. Red lentils are a pantry staple for me: they cook quickly, taste great, and are packed with fiber and nutrients. In the winter, I cook them into rich, comforting soups; in the spring and fall, they become Indian-style dal to eat with rice; and in the summer, I turn them into dips to accompany raw or blanched veggies, pita, or chips. The dips work equally well as a midday snack, office lunch, or munchie to serve with drinks. Here are three variations, two combining the lentils with sweet potato and one combining them with carrots. One teaspoon of smoked paprika imbues the dip with a faint essence of smoke; use more if you fancy a stronger flavor. To perk up leftover dip, stir in a little fresh lime juice just before serving. In a medium nonstick saucepan over medium heat, heat the olive oil until shimmering. Add the onion and ½ teaspoon salt and cook, stirring, until softened, about 4 minutes. Add the garlic, smoked paprika, cumin, and cayenne and cook, stirring, until fragrant, about 40 seconds. Scrape the mixture into a food processor work bowl and set aside. Add the lentils and 1⅓ cups water to the now-empty pan, return it to medium-high heat, cover, and bring to a strong simmer, stirring occasionally to prevent sticking. Adjust the heat to medium-low and continue to simmer, covered and stirring occasionally, until the water is mostly absorbed and the lentils break down, about 12 minutes. Off heat, cool to lukewarm. Add the cooled lentils, sweet potato, lime zest and juice, honey, 1¼ teaspoons salt, and pepper to taste to the food processor and process until smooth, about 1 minute, stopping to scrape down the sides of the bowl as necessary. Adjust the seasoning with salt and ground black pepper, if necessary. Scrape the mixture into a bowl, drizzle with olive oil, and serve. In a medium nonstick saucepan over medium heat, heat the olive oil until shimmering. Add the onion and ½ teaspoon salt and cook, stirring, until softened, about 4 minutes. Add the garlic, coriander, and cayenne and cook, stirring, until fragrant, about 40 seconds. Scrape the mixture into a food processor work bowl and set aside. Add the cooled lentils, sweet potato, 1⅓ cups of the feta, lemon juice, honey, 1 teaspoon salt, and pepper to taste to the food processor and process until smooth, about 1 minute, stopping to scrape down the sides of the bowl as necessary. Adjust the seasoning with salt and ground black pepper, if necessary. Scrape the mixture into a medium bowl, add most of the mint and most of the remaining ⅔ cup feta and stir to mix. Sprinkle with the remaining mint and feta and serve. 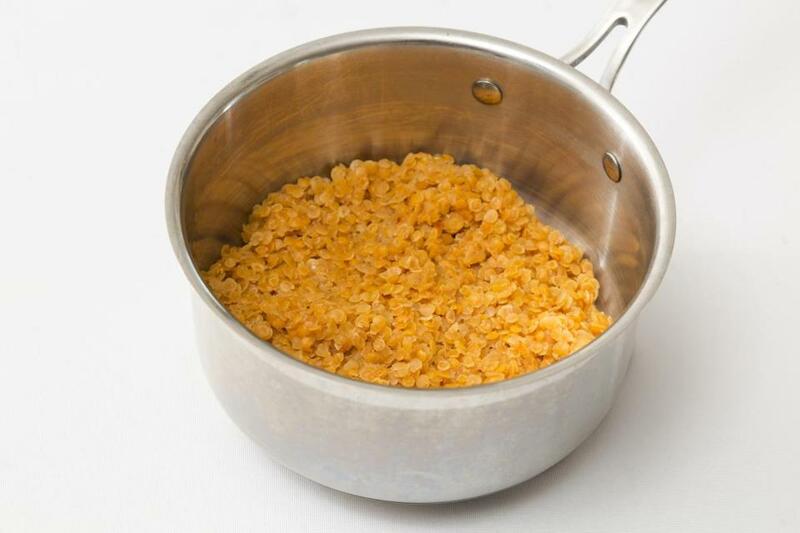 Red lentils break down when you cook them, transforming into a coarse, yellow mass. Do not despair — this is just the texture you want. Don’t forget to stir the lentils as they cook. If left untouched, they could stick to the pot for dear life. In a medium nonstick saucepan over medium heat, heat the olive oil until shimmering. Add the onion and ½ teaspoon salt and cook, stirring, until softened, about 4 minutes. Add the garlic, ginger, coriander, paprika, and cumin and cook, stirring, until fragrant, about 40 seconds. Scrape the mixture into a food processor work bowl and set aside. Add the lentils, carrots, and 1½ cups water to the now-empty pan, return it to medium-high heat, cover, and bring to a strong simmer, stirring occasionally to prevent sticking. Adjust the heat to medium-low and continue to simmer, covered and stirring occasionally, until the water is mostly absorbed, the lentils break down, and the carrots are tender, about 15 minutes. Off heat, cool to lukewarm. Add the cooled lentil-carrot mixture, lemon juice, 1 teaspoon salt, and pepper to taste to the food processor and process until smooth, about 1 minute, stopping to scrape down the sides of the bowl as necessary. Adjust the seasoning with salt and pepper, if necessary. Scrape the mixture into a medium bowl, add most of the cilantro and stir to mix. Sprinkle with the remaining cilantro and serve. Adam Ried appears regularly on America’s Test Kitchen. Send comments to cooking @globe.com.